Free Shipping Included! Acoustic Audio HT-55 5.1 Home Theater Speaker System (White, 5) by Acoustic Audio by Goldwood at Home Entertainment Centers Online. MPN: HT-55. Hurry! Limited time offer. Offer valid only while supplies last. This perfectly matched five speaker system contains three 5.25'' rectangular in-wall/ceiling speakers and two 5.25'' round in-wall/ceiling speakers. 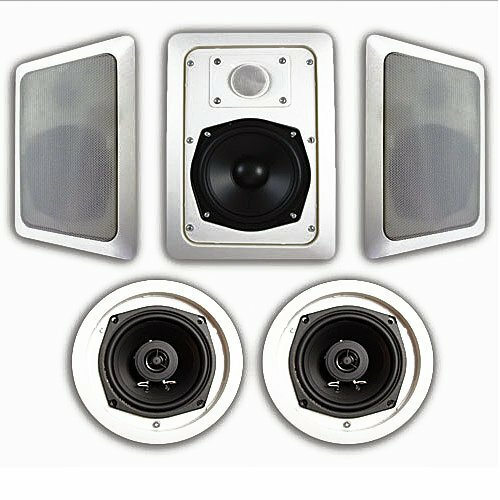 This perfectly matched five speaker system contains three 5.25" rectangular in-wall/ceiling speakers and two 5.25" round in-wall/ceiling speakers. This system is perfect for use in multi-room sound systems and surround sound home theaters. Because the speakers mount seamlessly into any wall or ceiling, there is no need to worry about unsightly speaker wire cluttering up your home or office. The white grills will match an array of home interiors, or can be easily painted to coordinate with a specific decor. Aesthetics aside, the sound quality of these speakers is unmatched. Each two-way speaker features high rigidity polypropylene cones with soft dome tweeters and butyl rubber surrounds. The result of this sophisticated engineering is 1000 watts of peak power handling (500 watts RMS handling).